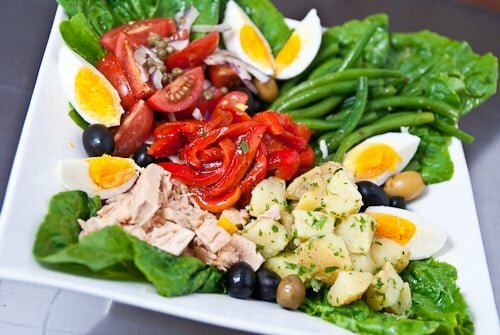 Niçoise Salad Recipe - Learn to make this French salad which includes niçoise olives, tuna, lettuce, potatoes, tomatoes and haricots vert with a vinaigrette. Salade Niçoise, originated in the Côte d’Azur region of France along the Mediterranean; a land who’s good olives, plentiful seafood and sunny climate are well represented in this vibrant salad. Named after its city of origin, Nice (pronounced like niece), Salade Niçoise typically includes tuna, haricots vert, tomatoes, olives and eggs, but it’s another one of those dishes where depending on who you ask and what country you happen to be in, you’ll get a different list of ingredients every time. In the US, Niçoise Salad was popularized in the sixties by Julia Child, and it’s taken its place along with Cobb Salad in the American brunch landscape. Today, I found myself sporting a serious hankering for salad, and given my proclivity for all things porcine, this struck me as a bit odd. But who am I to scoff at the salacious whims of my stomach? After all, isn’t it my stomach that also commands inspires me to cook things like this and this? One of the things that usually turns me off salads is that I really hate devouring a whole plate of leafy greens, only to find myself hungry again in a few hours. This invariably leads to me stuffing my maw with something like twinkies or chicharrón which kind of defeats the whole purpose of consuming the rabbit food in the first place. Thankfully, Niçoise Salad is not only tasty, it’s full of protein, carbs, and dense veggies between all the leafy bits, keeping my stomach occupied until the next meal. It also hits just about every color of the rainbow, which means it covers a similarly broad spectrum of vitamins and minerals. Personally, I like to have a little of everything on my fork, so the salad usually ends up as a colorful mess on my plate, but if you have some picky diners at the table, the structure of this salad makes it a lot easier to avoid certain things. Don’t let the ingredient list for this Niçoise Salad intimidate you. There are a lot of repeated items many of which you probably already have in your pantry anyway. I like to dress and season each component separately, but if you’re really pressed for time, you could always toss everything in a giant bowl and dress them together to save some time. You can also prep most of the components in advance, giving you time to attend to more pressing matters the next time you host a Sunday brunch. To make the dressing just whisk all the ingredients for the master dressing together. Other things will get added to this base as we season each item. For the haricots vert, return the potato water to a boil and add more salt (it should taste like the ocean). Prepare an ice bath by filling a bowl with water and ice cubes. Add the haricots vert and boil until they're bright green and tender, but they still have a bit of crunch (a minute or two, longer if you're using older beans). Drain and put them into the ice bath to "shock" them, this should make them turn a very vibrant green color. You don't want to dress these too early since the vinegar will make them discolor. If you're doing this in advance, wrap them and refrigerate until you're ready to serve them. 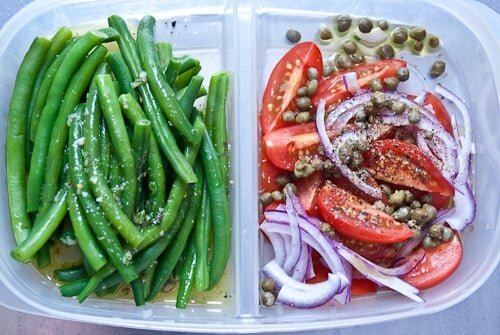 For the tomatoes, toss them with the onions and capers along with a little olive oil, salt and pepper. To assemble the salad, add the oregano and thyme to the master dressing and toss the whole lettuce leaves in enough dressing to coat each leaf. Lay them down on a serving platter then arrange the roasted peppers, potatoes, haricots vert, boiled eggs, Niçoise olives, tuna and anchovies around the plate. Serve the Niçoise Salad with a crisp, dry white wine like a Sauvignon Blanc or Pinot Gris. This is truly a filling and delicious salad…And I love the “Ortiz” anchovies you’ve added. They are the best! We did nicoise last night too but vegetarian; now that I see yours I really need to break the picts out of my flickr and onto the blog. And, I agree a little of everything on the fork is the way to go. Hein? Quoi? You stuff your face with twickies? Geeze man, get real, stuff it with macarons instead. You should do a salade niçoise-off with Stacey. I think it’s in her repertoire. Looks delicious! We tend to go overboard w. our salads too 🙂 Like the dressing recipe! I actually made this tonight, put the anchovies in and it definitely belongs there! Kosher salt, is it worth it ? I’ve never used it before but I’m tempted to buy some because I see it in a lot of recipe books now. such beautiful colors. dying to try this! Oh gosh, those beautiful colors! I never order Nicoise salad in restaurants because I don’t like olives and I am too impatient to pick them out, but your version has convinced me to try making an olive-free version myself. On a completely random note, I was on Facebook this morning and you showed up in my list of “people you may know”! We don’t have any mutual friends, and there’s seemingly no connection other than us both living in NY, but I do read your blog obsessively… so I’m now convinced that FB is either psychic, or stalking me. you know, we used to make nicoise for dinner all the time back in the day (esp. after a weekend of eating lots of fat). totally forgot how much i love it. and i also crave salads in summer – esp. on a humid nyc day. It doesn’t actually taste any different than table salt, but it’s easier to control because the granules are bigger. This makes it easier to pinch and harder to oversalt. It’s also really cheap. It’s also nice when you want to have little granules of salt on something (like bread). mmm…. I just made matio batali’s oil packed tonno… It’ll blow your mind. Poached in vinegar and spices. Do try it…. Thank you for using canned tuna in this! I love that Ortiz stuff. Was it the tuna belly? Now for a challenge: make all the same flavors appear.. in a macaron. I know you can do it. hehe. Lovely composed salad, Marc–love the texture on the egg yolks. They look just barely set. Nice! I want to eat the screen. Looks delicious, and I really like the idea of preparing each component separately. Oh, I’m a sucker for niçoise. I almost always order it when I see it on menus. Oooh, I love it deconstructed like this! I’m a sucker for anything French. This is one of my favourite salads. 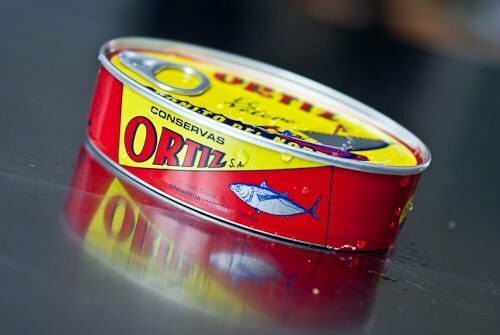 I can never find tasty canned tuna packed in olive oil in Vancouver. It’s hard to find. And I think it’s important in this recipe! Your pic looks yummy! That is one hearty and tasty looking salad! I [heart] Niçoise salad, especially with the anchovies. Believe it or not, I didn’t like anchovies until I had this salad. Now I put it in my salads, pasta, etc. mmmm…. I love this canned tuna on my Nicoise salad. My favorite salad in the universe. How about some white anchovies on top? I still have the package for you in my fridge!